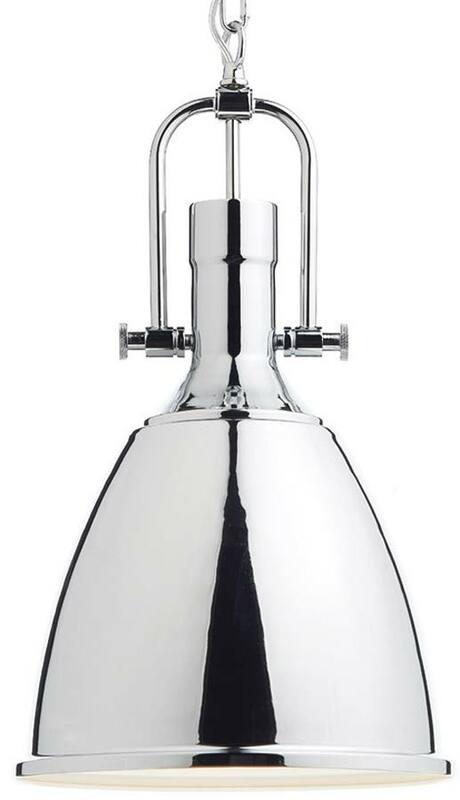 The Dar Nolan industrial style 1 light kitchen pendant in polished chrome, a trendy ceiling light, with a bell shaped shade, polished chrome hinged stirrup, multi-link chain suspension and slender circular ceiling mount. Supplied with one meter of suspension chain and flex allowing it to be mounted from higher ceilings or it can be adjusted in length at the time of installation to suit your requirements. Minimum height 56cm, maximum drop 156cm. Other products in the Nolan industrial style pendant range can be viewed below and include a clear glass pendant light.